What's Happening at Saint Christine's? Forgot to get a bulletin this week? Don't worry, you can read it online just click the Weekly Bulletin image below for the complete bulletin. We have also listed a number of highlighted bulletin announcements below for your convenience. Do you know when you're serving on the altar next? Current ministry schedules can be found in the Schedules area. Are you new to the parish? 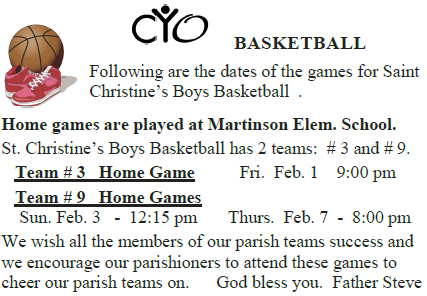 Complete a Parish Registration Form, Find out when your child's CCD classes will be or what activities we have planned. It's all here. You can support Saint Christine’s Parish on a regular basis by signing up for Online Giving. By giving your weekly contribution on a recurring electronic basis, you help our parish more accurately forecast our finances. This method is a safe, secure and dependable means of giving for you and our parish and it is more convenient for you. Learn more about setting up an Online Giving account. Not quite ready to create an account but would like to support the parish? Consider using "Quick Give" to make a one time online gift/donation using your credit card. Learn more about Quick Give. arrested and crucified. His body was placed in a cave. Soldiers were placed to guard the tomb. Our choir, our lectors, our Eucharistic ministers, our servers, our coordinators, our presiders, our staff and you did an amazing job sharing this story on Palm Sunday. Holy Week liturgies allow each of us to celebrate God’s wonderful power as evidenced in the death and Resurrection of Jesus. New life is possible as Jesus is present in our lives. We all know the story – and on occasion, we are the characters in the story. We may cheer Jesus on, only to find moments later we are cowering in fear that someone might know we are a person of faith. We know Judas betrayed our Lord, Peter denied he knew Him and all the disciples cringed in fear in a room with locked doors after His death. Most of us can readily identify with each of these. 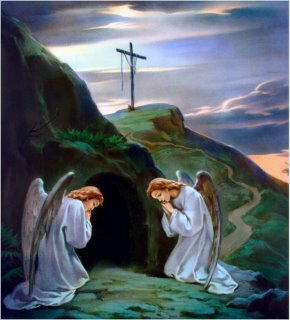 The women were brave enough to go to the tomb to care for a dead body. Peter and John later ran to the empty tomb, looking inside to try and make sense of this amazing discovery. You know the story – we tell it every year – through music, through readings, through hymns, through worship, through fire, through water, through example – we tell it every Sunday as we gather in worship on the first day of the week and bear witness to the Resurrection of Jesus. But we must also tell the story with our lives, with every word we speak and every action we take. Remember on this Easter Sunday morning; it not just what we believe but how we believe that reflects our understanding of the Resurrection. He is risen! He is risen, indeed! Alleluia! in our parish and our community through our actions of love and care. Thank you for your generous and faithful support of our parish. the ushers’ tables next weekend. Thank you for your generosity and support of our parish family. If you are uncertain of your child’s rehearsal date, please call your child’s teacher or the CCD Office. Our Religious Education Program officially ends Sunday, May 5th at the 9:00 am Mass. All of our students are encouraged to attend this year-end liturgy. Our First Communicants will participate in our annual May Procession so ALL second graders are encouraged to come to this Mass in their First Communion attire. There will be a reception following Mass in the parish hall and our First Communion Quilt will be raffled off. Click on the Weekly Bulletin link above to read all CCD Announcements. All parents of our 8th grade students, including those who will attend Catholic high school, must register their child for the Confirmation Program. If you have not registered your child yet, please call Maryanne Bursaw at 781-834-6003 x 23 to make arrangements. Silk Roses will be available for purchase after all the Masses. All proceeds will benefit Mass Citizens for Life in their effort to fight abortion and euthanasia. Thank you for your generosity. The Men’s Group is a unique way for men to share their faith with each other. All men of the parish are invited to come on Saturday, April 27th at 7:30 am for Mass followed by a discussion on ‘Our Faith Through Art: The Sacraments’ in the parish hall. Please call Norm Shacochis at 781-834-4097 for more information. VOCATIONS : We ask that our parishioners pray for vocations to the priesthood and religious life. REFLECTION: Following the example of Jesus, how can you be compassionate even while you are suffering? BULLETIN SUPPORTERS: We sincerely thank all of our advertisers who have placed ads in our bulletin. Please support the businesses that advertise in our parish bulletin as their ads help to defray the cost of the bulletin. Saint Christine’s now has a Facebook page. We will use the Face Book page to post parish news, events, CCD cancellations, photos and more but we need your help. Visit www.facebook.com/stchristinesmarshfield and “LIKE” our page to help spread the word. We’re new to Facebook so please bear with us as we get up to speed with social media. You can also link to our Facebook page whereever you see the Facebook logo on our site. CCD & PARKING LOT REMINDER!! Please exercise extreme caution in our church parking lot while dropping off and picking up children from classes. Please drive slowly in the parking lot and refrain from using cell phones. Children move quickly and your full attention is needed. REMINDER: The Marshfield Fire Department has requested that our parishioners refrain from parking in front of the church as it prevents their access in times of emergency. Please do not deposit any old papers in the recycling bin in the church parking lot. The company that emptied the bin has gone out of business. We will no longer recycle paper. Please check your schedules to see if/when you are assigned. If you unable to serve your assigned Mass, it is important that you call a substitute to serve for you. If classes are cancelled due to weather, notification will be available on Channels 5, and 7. Please tune into these stations or log onto their websites. Additionally, cancellations will be announced on WATD radio (95.9). Please note that if Marshfield Schools are closed, Saint Christine’s CCD classes are also cancelled. All children in Grades 1 through 3 must have a parent or another adult accompany them to and from class each week. Parents must sign children out before they are released from their class.